SEE RIGHT NOW with TIMOTHY PEROZEK (Las Vegas) - Book Appointment Online! 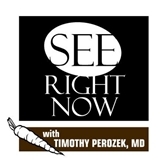 SEE RIGHT NOW with TIMOTHY PEROZEK, MD is a comprehensive medical and surgical Ophthalmology practice located on the campus of the Summerlin Hospital in Las Vegas, Nevada. We are proud to offer the Latest Technology and the Most Compassionate Patient Care. Dr and staff very friendly, professional, and helpful! Dr. Perozek addressed my issue immediately. I was happy and comfortable with the choice I made with choosing Dr. Perozek.